We were honored to attend an event at the City of Calabasas City Hall last week to accept grant money on behalf of Chaparral. 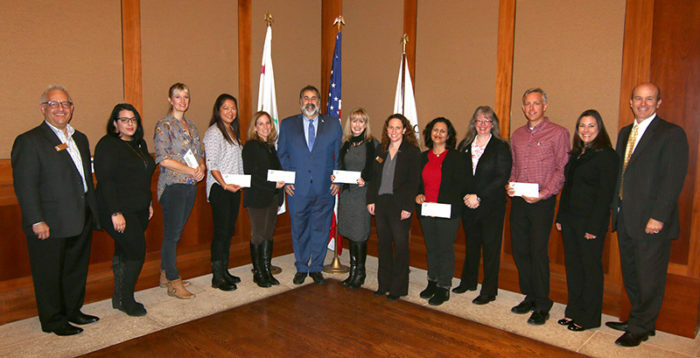 This year, the city again provided generous grants to all Calabasas LVUSD schools. At Chaparral, these funds go toward scholarships, campus improvements, special programs, student publications, and much more. We are so thankful to the Calabasas City Council for its continued support of the city’s public schools. When you have a moment please take a look in the Kinder courtyard, the PFC purchased two new outdoor tables in an effort to extend the classroom outside. Keep an eye out for more tables in the future, we plan on putting them around the entire campus for all grades! On Sale Now… the first and only time yearbooks will be on sale this year! Get together with friends and plan a Chaparral Party! These parties are an important part of the auction’s success and such great community-builders. Click here for more information. Donate items – it’s not too late to donate an item or ask a friend, family member, or local business to donate. Our auction is only as good as the items donated! Finally, please remember we are all in this together. From drop-off to pick-up and everything in between please be respectful and courteous to fellow parents and students. Our kids are watching us more closely than we realize, be the role model your kid needs you to be. We look forward to seeing you at our next PFC meeting this Wednesday!